The iStent Trabecular Micro-Bypass Stent is a tiny medical device used at the time of cataract surgery to lower pressures in patients with glaucoma. Glaucoma is a medical condition where the pressure inside the eye is too high, leading to progressive optic nerve damage. Open angle glaucoma, the most common form of glaucoma, is essentially a backing-up of fluid due to a drain that has become increasingly clogged. The main drain in the eye is call the trabecular meshwork. The iStent is placed within the trabecular meshwork, creating an open passage though this clogged drain. 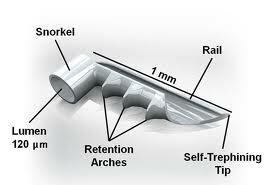 The Retention Arches (see above image) keep the iStent buried in position within the trabecular meshwork, and only the Snorkel is exposed. The Lumen of the Snorkel allows the fluid in the eye to easily bypass the trabecular meshwork, and in turn, results in a lower intraocular pressure.